This week's "project" is actually a giveaway of a previous Makery project timed in conjunction with the Mother's Cookies Comeback Celebration. If you're a regular reader you know from the many posts inspired by the company's products in one way or another that I'm a fan. So of course I agreed to participate when contacted about the virtual celebration and related "scavenger hunt", especially when I learned it would involve receiving four free bags of cookies, two to keep, and two to giveaway (and seeing as how I joined Weight Watchers just a few weeks ago, I definitely can't keep all four bags myself!). Between October 27th (that's today!) and November 10th, frosted circus animal junkies like myself will be featuring banners like the one you see to the right that you can click on to go to a cookie collection page where you can see how many cookies you've found and how many more you need to collect in order to receive a coupon for your next bag of Mother's cookies. Sweet! To help get the party started, I'll be giving away two bags of cookies to two lucky readers (one each). 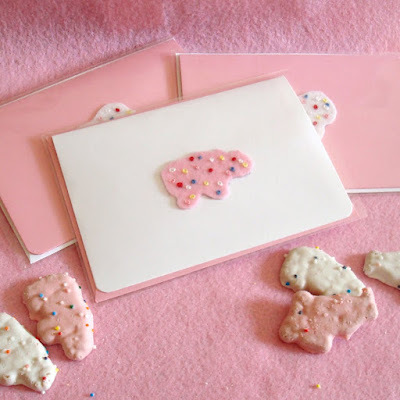 Each bag will arrive with a free set of two of my 'homage to Mother's Cookies' notecards (one with pink "frosting", one with white, similar to the cards in the image above). If you'd like to participate, just leave me a comment to that effect on this post as well as your email address, if it's not included in your profile, so that I can contact you if your name is one of two I'll randomly select on Wednesday, November 11th. The Makery will return to its regularly scheduled programming on Monday, November 16th. 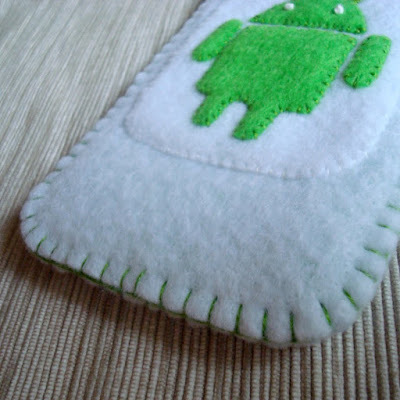 To date, I've sold four of the Android phone cases I blogged about a couple of weeks ago. How cool is that?! 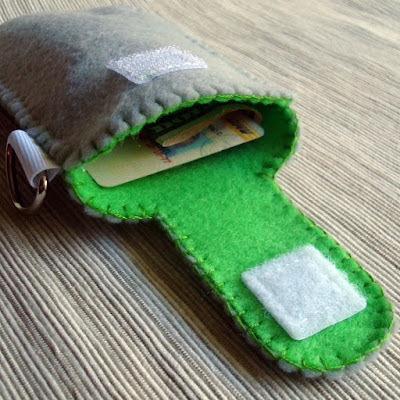 Two of my recent sales were actually for version 2.0, so to speak, which I "mocked up" after a prospective customer "convo"-ed me about adding a few more features, namely a second, interior accessory pocket, a top tab velcro closure, and a metal D-hook attached to the side for car keys or a swivel hook/strap combo of some sort. There's only so much you can do with felt and blanket stitch and the fact that these are completely handmade (I do have a sewing machine but I haven't used it regularly for almost 20 years), but I'm pretty happy with the revised version. Ironically that customer has yet to buy one but two other customers seemed equally fond of the added features. So it's all good. 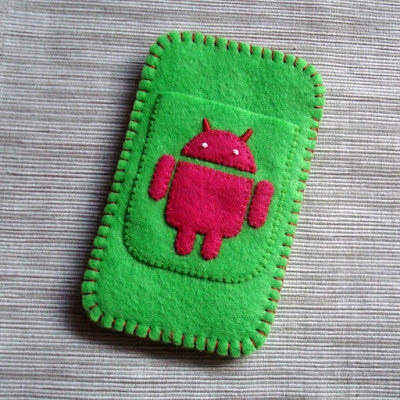 The original phone case is still available, of course (just packaged the custom green and magenta case pictured above), and received a little love from this blog and this one ("an Android for grandma"!) a couple of days after I originally listed it, probably thanks to Neal tweeting about it and one of his followers re-tweeting it. Not exactly going viral or anything, but I'm glad my little Android dude is getting some love. By the way, the Makery will be a day late again this week, but this time it's not my fault. The "event" this week's "project" coincides with doesn't start until the 27th. Check back then for a true giveaway, times 2! Sadly, folks, I got nothin'. Last week was the week of inquiries into both Etsy shops (and I sold a cozy!) and I'm still catching my breath. Which makes it sound more impressive than it is. When most of your day is occupied by feeding, entertaining, and wiping the bottom of a cranky toddler, it doesn't take much to disrupt what you've learned to accept as normalcy over the past 16 months. Getting only six or seven hours of sleep each night catches up with you real quick. But I promise I'll make it up to you with next week's post, which will involve a partly edible giveaway for not one, but TWO lucky readers to enjoy. 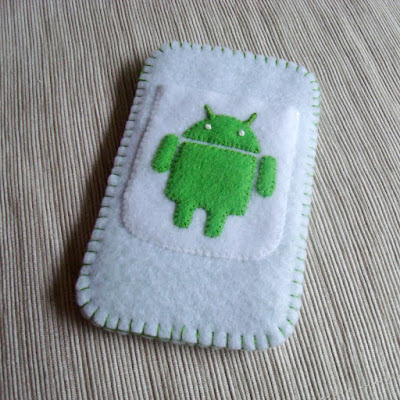 fresh from the Makery: because Androids need cozies, too! 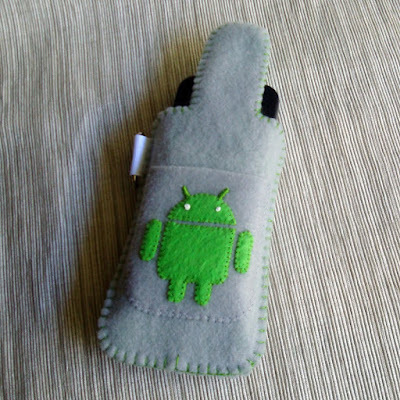 I'm a day late, but (not to toot my own horn or anything) I'm pretty pleased with this week's project - a phone case for all the other mobile device users out there (yep, that's right folks...there are gadgets made by companies other than Apple). 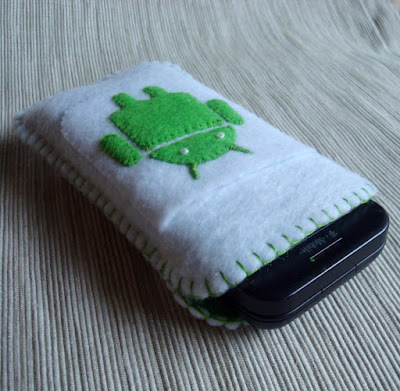 It was Neal's idea to make a phone cozy for his T-Mobile G1 (a bit longer and significantly chunkier than the iPhone), complete with a little green felt Android Robot stitched onto an accessory pocket on the front. The example shown here and listed in my shop is actually the second version I made, not totally satisfied with the original prototype, which is now in the care of a certain 15 month old. 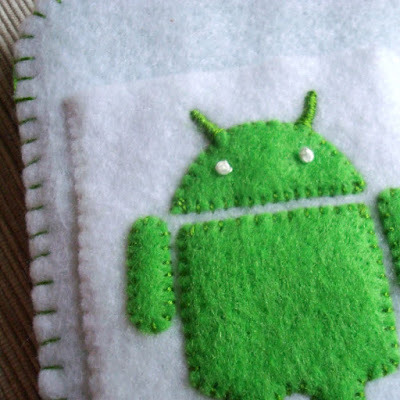 I used embroidered French knots for the eyes, of course, and learned the lovely blanket stitch for the edge. I've been wanting to do more with felt material in general (especially considering I still have quite a bit of the tan felt leftover from those DIY cat carrier covers) and with the theme of food in particular. I'm not sure why felt lends itself so well to making fake food, but I know I'm not alone in the discovery of this perfect pairing. I've also wanted to do more with the "frosted" circus animals that can be found so far primarily on paper products. Since I've already made one reusable coffee cozy/cuff/sleeve, putting the two together seemed like a perfect fit. This week's project uses up a bit of the tan felt, along with a layer of pink on the inside, and features a "parade" of four animal cookies in alternating pink and white marching around the outside. 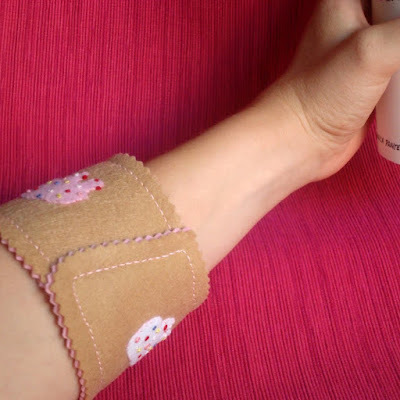 And when you're not using it on a to-go cup of coffee or tea, you can wear it as a bracelet! Okay, that last image is mostly a joke, but you could theoretically wear it as a bracelet on your way to your local caffeine fix. 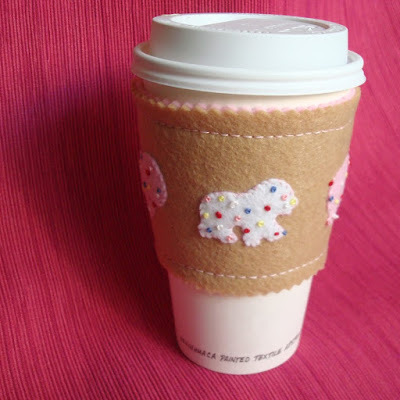 And as I write in the Etsy listing, where for only twelve bucks you can purchase your very own handmade Mothers Cookies coffee cozy, this reusable sleeve is not only eco-friendly but also easy on your diet. I don't know about you but I'm always tempted to get some sort of baked good to go with my already unnecessary enough (unnecessary in terms of caffeine and calories, but totally necessary for my sanity) vanilla latte (from Peets, naturally). Maybe if I use this thing I'll be better able to resist that temptation.